Visiting Lake Tahoe is always fun. You can add to your enjoyment with a stop at Taylor Creek Visitor Center, operated by the Lake Tahoe Basin Management Unit of the US Forest Service. While most organized activities occur during the summer months, visitor center grounds are open all year for easy hiking and viewing the spectacular scenery surrounding Lake Tahoe. There are year round exhibits and organized activities at Taylor Creek Visitor Center. Many things going on at Taylor Creek happen at specific times while others come and go according to the season. It's always a good idea to check the Taylor Creek Visitor Center website or call ahead to make sure your planned activity will actually be possible. One of the most interesting things to do at Taylor Creek Visitor Center is take the short walk on the Rainbow Trail to the Stream Profile Chamber, where you can observe a section of Taylor Creek's underwater environment through a panel of windows. This is an amazing vantage point from which to see the Kokanee salmon run in October each year. 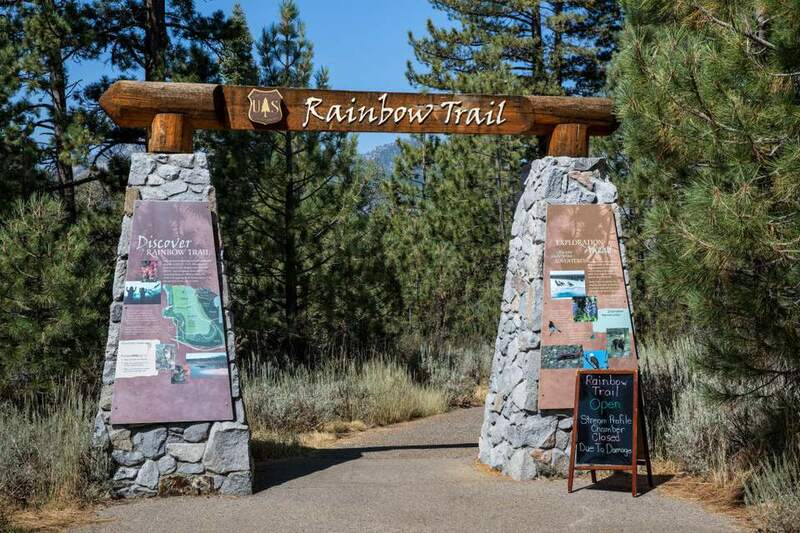 Several nature trails are available at Taylor Creek Visitor Center, including the Rainbow Trail, Tallac Historic Site Trail, Lake of the Sky Trail, and Smokey's Trail. These are all easy and take you to various places in the visitor center vicinity. During summer months, there are naturalist led programs at the Taylor Creek Visitor Center. Except for special events like the Fall Fish Festival, these activities mostly end after Labor Day. The Tallac Historic Site is next to the Taylor Creek area. It preserves an era of Lake Tahoe history when the rich and socially connected built private estates on the lakeshore. The Baldwin and Pope estates, and one called Valhalla, have been preserved here and are open for tours and other events at various times. Visitors are free to roam the grounds and learn about the area from interpretive signs. There are picnic tables, restrooms, a parking lot, and a sandy beach, all of which are free and open to the public. Dogs are allowed, but must be leashed. The open season is Memorial Day weekend through September. In winter, the Taylor Creek / Fallen Leaf area is transformed into a cross-country ski area especially suited to beginners. Using the area is free, but you need to purchase a California SNO-PARK permit for your vehicle. The SNO-PARK season begins November 1 and ends May 30. The dates may vary somewhat depending on snow conditions. California SNO-PARK permits are also good in Oregon. The Taylor Creek Visitor Center is three miles north of the town of South Lake Tahoe on Hwy. 89 (locally known as Emerald Bay Road). It is a right turn (toward the lake), just past the Tallac Historic Site turnoff. There is a big parking lot, but be prepared to jockey for a spot on busy weekends.